Chateau Marquis d’Alesme can trace its roots all the way back to 1585. 31 years after the estate was created, they began planting vines and cultivating their vineyard. The name of the property, Marquis d’Alesme, comes from one of the early aristocratic families that previously owned the estate. Chateau Marquis d’Alesme changed hands during the French revolution. In 1809. the Medoc chateau was sold to a Dutch wine merchant, Jean Bekker Terrlink, who changed the name of the property to include his middle name, and Chateau Marquis d’Alesme Becker was born. Comte Jean-Jules Theophile Chaix-d’Est-Ange bought Chateau Marquis d’Alesme Becker in the early 18th century. At the time, he was already the owner of Chateau Lascombes, which he obtained from his father. He wanted to combine both Margaux vineyards to create one large Medoc property. He passed away in 1923 before he was able to create the single vineyard. The original Marquis d’Alesme chateau became the office for Chateau Lascombes, with the chateau of Desmirail taking its place. A succession of owners followed until 1938 when the property was sold to Edmond Ritz from the Alsace region. His grandson, Jean Claude Zuger inherited the estate. If the Zuger name sounds familiar, it is because they are the owners of another Margaux property, Chateau Malescot St. Exupery. In 2006, Chateau Marquis d’Alesme Becker was sold by the Zuger family to the Perrodo family for 25 Million Euros. This was a logical estate to buy for the new owner, Hubert Perrodo, as he already owned another Margaux vineyard, Chateau Labegorce, which he obtained in 1989. Sadly, Hubert Perrodo was killed in a skiing accident shortly after buying the property. The estate is currently managed by the daughter, Nathalie Perrodo. Chateau Marquis d’Aleseme underwent a massive renovation to the estate that was completed in time for the 2015 harvest. The design, created by the architect Fabien Pedelaborde,(who recently finished a renovation and redesign at Chateau Soutard in St. Emilion) is a blending of Asian and classic French influences that came from the owner, Nathalie Perrado, who is half Chinese and half French. The exteriors of the building retained the classic French styling’s of the chateau. Inside however, the design showcased distinctive influences from China. Above the fermentation vats, a large, bronze dragon with 22,000 scales has been designed to hang from the wood ceilings with patterns that take into account water, earth and heaven impressed into the cement. It is really a unique design to Bordeaux and is well worth the visit. One other important change came about under the direction on Nathalie Perrado. The estate now use the shorter version of the wineries name, Chateau Marquis d’Alesme. They dropped the word Becker, helping to make the wine easier to market. Here’s a hot tip for you. The new renovations include the addition of Le Hameau, a cool, wine bar that also serves snacks. It’s a great, secret spot in the Margaux appellation to visit, when you need a break. The 15 hectare Left Bank vineyard of Chateau Marquis d’Alesme is divided into 3 unique terroirs and soils. They have a section of the vineyard with silica and gravel soils situated close to the D2 road is planted to 63% Cabernet Sauvignon, 30% Merlot, 5% Petit Verdot and 2% Cabernet Franc. This shows a marked increase in the amount of Cabernet Sauvignon and new plantings of Cabernet Franc. There is a parcel located next to the chateau that consists of silica and gravel soil and some clay in the terroir that is planted to 100% Merlot. The third section of the vineyard is mostly young vines, which is the source for their second wine, Marquise d’Alesme. On average, the vines are kept at 40 years of age. The plantings are at a vine density of 10,000 vines per hectare. Today, Chateau Marquis d’Alesme focuses on utilizing, self sustaining, vineyard management techniques. To produce the wine of Chateau Marquis d’Alesme, vinification takes place in a combination of temperature controlled, traditional oak vats and cement tanks that are 80 hectoliters in size. Malolactic fermentation takes place in barrel. The wine of Chateau Marquis d’Alesme is aged in 60% new, French oak barrels for an average of 18 months. For the first three months of the aging process, the wine is aged on its fine lees. There is a second wine, Marquise d’Alesme, which was created in 1988. On average, the annual production of Chateau Marquis d’Alesme is close to 7,000 cases per year. The best vintages of Chateau Marquis d’Alesme are: 2018, 2017, 2016, 2015, 2014, 2012 and 2010. Prior to 2010, the wines from Chateau Marquis d’Alesme were not exciting. But things turned around for the estate with their 2010 Bordeaux wine. 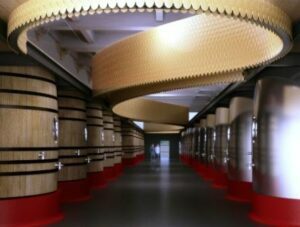 With a spare no expense attitude, which included building a new fermentation cellar equipped with a combination of state-of-the-art stainless steel vats and new French oak tanks. The selection process both in the vineyards and cellars is also much more severe. The estate has also hired Michel Rolland as their consultant. 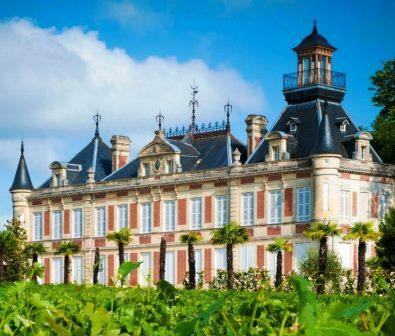 All of this adds up to the fact that this is now a Margaux property to watch that offers quality wine, with character for a fair price, especially from a Classified Growth. Chateau Marquis d’Alesme can be enjoyed young with decanting. Young vintages can be decanted for an average of 1-3 hours, give or take. This allows the wine to soften and open its perfume. Older vintages might need very little decanting, just enough to remove the sediment. Chateau Marquis d’Alesme is usually better with at least 7-9 years of bottle age. Of course that can vary slightly, depending on the vintage character. Chateau Marquis d’Alesme offers its best drinking and should reach peak maturity between 10-20 years of age after the vintage. Chateau Marquis d’Alesme is best served at 15.5 degrees Celsius, 60 degrees Fahrenheit. The cool, almost cellar temperature gives the wine more freshness and lift. Chateau Marquis d’Alesme is best served with all types of classic meat dishes, veal, pork, beef, lamb, duck, game, roast chicken, roasted, braised and grilled dishes. Chateau Marquis d’Alesme is a perfect match with Asian dishes, hearty fish courses like tuna, mushrooms and pasta as well as cheese. Blending 61% Cabernet Sauvignon, 33% Merlot and 6%, Petit Verdot, the wine quickly shows off its floral essence with black cherry and spice box notes. Sweet and fresh, the wine is full bodied, soft, refined and displays its freshness and ripe cherries with a bit of cocoa just as you approach the endnote. The wine reached 13.5% alcohol. The harvest took place between September 25 and October 6. Blending 62% Cabernet Sauvignon, 30% Merlot, 5% Petit Verdot and 3% Cabernet Franc produced a deeply colored wine. The bouquet evokes wet earth, truffle, licorice, dark red fruits and flowers. Sweet boysenberry and cherry fruits, full body and a long, vibrant finish with polished, ripe tannins are what you'll find here. The wine reached 14% alcohol with a pH of 3.75 and is aging in 60% new, French oak barrels. In the middle or at the top of my score is where this beauty is going to end up. The fruit is ripe, the nose offers fresh picked flowers, cherries and earth, and the finish follows through on everything. Flowers and cherry pipe tobacco aromas create the nose. On the palate, the wine is elegant, medium bodied, soft and fresh, ending with black raspberries and spice in the finish. Give this 2-3 years to develop more complexity. Tannic, medium bodied and with the right amount of raw materials needed to age and develop, the wine will take a few years to soften and show its dark cherry fruits. Deep purple in color, licorice, earth, espresso and blackberry, the wine is concentrated, round and polished, ending with sweet blackberry, chocolate and a kiss of oak. Blending 60% Cabernet Sauvignon, 17% Cabernet Franc, 15% Merlot and 8% Petit Verdot, this ruby colored wine offers light aromas of chocolate covered cherry, pepper, licorice, earth and mint. On the palate, this medium bodied, soft textured wine features bright, tart cherry and green olive flavors. I'd drink this on the young side. Things took a big step in the right direction with the 2010 wine, which is one of the better value plays from Margaux. Fully mature, light in color, light in fruit and delivering more secondary, earth, tobacco, green, leafy notes than its red fruits. Soft texture, without the stuffing for much aging, this is a wine to open over the next few years. Current vintages from the new owner show marked improvements.